← Why Don’t Iowa Farmers Export More to Europe? Cucumber salad is not even a recipe. Peel them, slice and put them in a bowl. Add thinly sliced onions, extra virgin olive oil and your favorite vinegar, then salt and pepper to taste. Mix gently then serve. It’s summer in a bowl. When the garden produces them, we eat a lot of cucumber salads. This year I mastered the art of cucumber growing with a couple of simple things. First, I mulched as soon as I planted the seedlings. Then, I made sure deer had no access to the plants. I also put up cages and a fence for the vines to grow upward. The result has been abundant. Other than in pickles, cucumbers don’t preserve well. They must be enjoyed in the moment, and sometimes that’s as good as it gets. 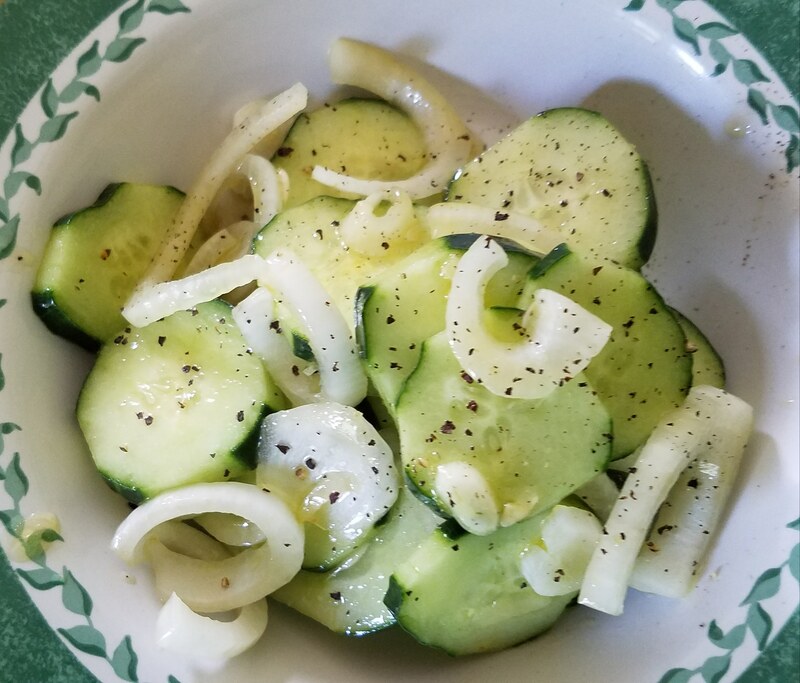 This entry was posted in Cooking, Garden, Local Food and tagged cooking, cucumbers, Garden, local food, recipes. Bookmark the permalink. Makes me salivate just thinking about it:) My mother often made something like this when I was a kid to use some of the cukes from our garden. I think that she used mayo, though, and never seemed to buy olive oil. It was good, though.